You faithfully performed your duties for your country and completed your military service. Now the injury that you sustained during your time in the military is keeping you from living a full life. You need to submit a disability claim for your service-related injury, but you don’t know where to begin. Maybe you have gotten started but, so far, the process has been confusing and frustrating. You need answers. Who Can Apply For Veterans Disability Benefits? If you are a veteran of the U.S. military and have a current injury or condition that is connected to your service, you may be eligible for disability compensation. You must prepare yourself – the veterans disability claims process is lengthy, time consuming, and includes a lot of paperwork. This process can be even more frustrating if you don’t have someone on your side to help you. A Veterans Service Officer (VSO) can be your advocate for your initial claims process. A VSO is a representative of one of the many veteran service organizations that exist to support veterans. A good VSO has a lot of experience filing veteran’s disability claims. A VSO will assist you with understanding your eligibility, gathering appropriate information, and filing your claim. Throughout the process a VSO should provide you with the support you need to successfully navigate the VA system. They should answer your questions, help to resolve your problems, and provide you with the assistance that you need and deserve. These organizations often have offices within VA facilities, but that does not mean that they are associated with the VA. They are generally outside organizations staffed with Veterans Service Officers (VSOs) that can help identify benefits that you may qualify for and help you to apply for your benefits. At your first appointment, the VSO will work with you to identify potential veterans benefits that you and your family may be eligible for through the VA. In order to represent you and help you file any applications or appeals, the VSO will have you complete paperwork (i.e., a Power of Attorney or POA) that gives them permission to access your records and speak with the VA on your behalf. Please note that this POA is for VA benefits purposes ONLY. Make sure to read the forms carefully before signing them so that you understand which organization you are working with and what types of access you are granting to the VSO. Service treatment records (establishes an injury in service) – bring your own copy if you have one; if not the VA will request them from Archives when you file your claim. Medical records (establishes a current injury) – you must obtain private treatment records yourself. The VA will only have access to VA Medical Center records. Statements from individuals that you served with (“buddy” statements), if necessary – these statements will help provide witness testimony confirming that your disability was noticed by other individuals while in service. A Disability Benefits Questionnaire completed by your physician, if you have a private physician. If you are only seeing VA Medical Center physicians, the VA will request that a physician complete the DBQ at a Compensation and Pension exam. 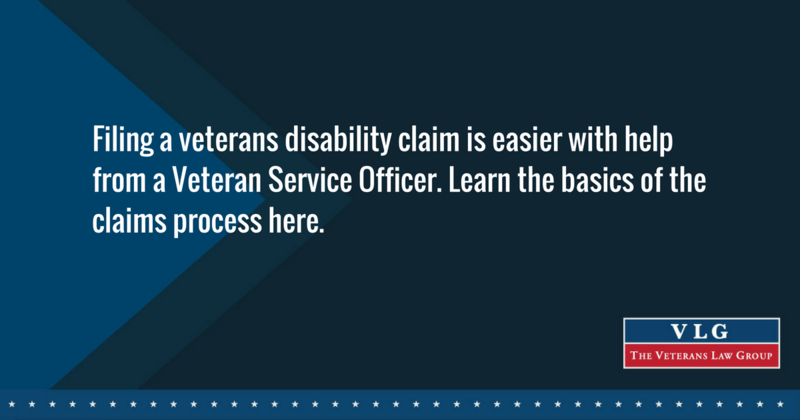 Once you have gathered all of the required information, contact your VSO to set up a time to submit your claim for veterans disability benefits. What happens once the VSO helps me submit my claim? Copies of any documents filed including confirmation of fax or delivery to the VA; remember, the VSO doesn’t work for the VA so it’s important to make sure that the VSO delivers your documents to the VA.
After the application is submitted, you will be able to call the VA to check the status of your veterans disability claim. Additionally, you can register online to check the status of your claim at https://www.ebenefits.va.gov/ebenefits/homepage (your VSO can assist you with the eBenefits registration process). Please note that the eBenefits page and the 1-800-829-1000 are often confusing or missing information. You can get a better status check by contacting your VSO. As you wait for the VA to review the evidence, it is important to continue to attend your medical appointments. If you see physicians, psychologists, or other medical professionals through private insurance or outside of VA treatment, you should request a copy of your records after each visit and inform your VSO of any updates or changes in your medical conditions. The most important thing is to not get discouraged. The VA Disability Benefits Claim Process can be lengthy, overwhelming, and frustrating, but finding answers to your disability claims questions doesn’t have to be difficult. Take our free quiz today to determine what resources are available for your specific needs.